My roommate, Rubina, is an amazing cook and entertainer. I love living with her for many reasons, mainly because she’s a dear friend and a good sounding board on all of life’s most important issues. We discuss practically everything, but if you were to bug our place, you would find that well over half of our conversations center around food. Every once in a while those food conversations are comprised of brainstorming sessions over what we (read: she) could make to use up things in the fridge that are about to go bad. Rubina has a gift for trash-aversion recipes, which she says comes from growing up with immigrant parents who taught her the value of resourcefulness and the horror of wastefulness. I come from culturally similar stock, yet never cease to be surprised by the creativity Ruby employs to avoid throwing anything out. 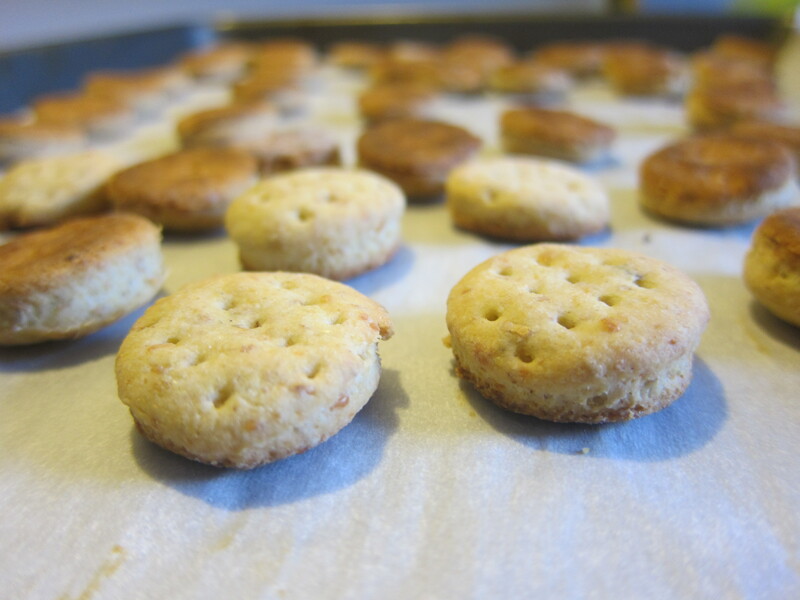 Case in point: the cheese crackers that just came out of our oven. We had a wee bit of blue cheese in the fridge and, because our friend Glenn had recently blown our minds by making a quiche out of it, we had blue cheese baked goods on the mind. Also on the verge of expiring: a bit of cheddar and some buttermilk purchased for another baking project long completed. So, Rubina whipped up a quick biscuit dough, rolled it out and with the round end of an icing tube decorating tip, cut the dough into tiny circles and baked those into jumbo oyster cracker sized bites. She made two batches of buttermilk cheese crackers: cornmeal blue cheese and whole wheat cheddar. Our house now smells amazing. Bet you wished you lived here, too. You know who else is great at averting food waste? My friend, Virginia of Italicious. I’ve featured her Reused Recycled page here before. If you haven’t clicked through her site in while, check it out. Their family recently moved back to Italy, this time to the South, so it’s the dawn of a whole new chapter of food talk and recipes. I’m sad they’re far away, but delighted to live vicariously through the yummy posts. This entry was posted on Monday, February 20, 2012 at 5:10 pm and is filed under Upcycling. You can follow any responses to this entry through the RSS 2.0 feed. You can leave a response, or trackback from your own site. Such a great, small world. Enjoying the blog….came across youe refernce to virginia in italy….shes my awesome friend, too, and I misd her, and am enjoying living vicariously through her facebook posts. You write great stuff…thanks. Thank you! Glad to know a friend of a friend stumbled across the site and is enjoying the posts. Thanks for your kind words, Jenny!